Is mechanical weed control getting closer to fully replacing herbicides? Harry Henderson, knowledge exchange technical manager at AHDB, believes so. With crop protection products coming under pressure to be withdrawn, and this trend only looking likely to gain pace, new solutions need to be found. Work can be done to suppress weed germination before a field crop is established but many crops rely on selective herbicides. Another way is to inter-row hoe between the plants. Indeed this form of weed control existed before herbicides were developed but weeds could still get away in the areas between each plant. While mechanical hoeing has never really gone away, the advances of GPS based precision planting - ensuring plants are in a uniform, straight row and placed accurately within the row - and vision based weed identification have come together to produce a very effective weed control system. This has been recognised at this year’s LAMMA show Innovation awards, where Garford Farm Machinery came away with a Gold award in the Arable Innovation category. Based near Peterborough, Garford has been blazing a trail in this area for years. This latest addition to the portfolio caters for the baby leaf salad growers. 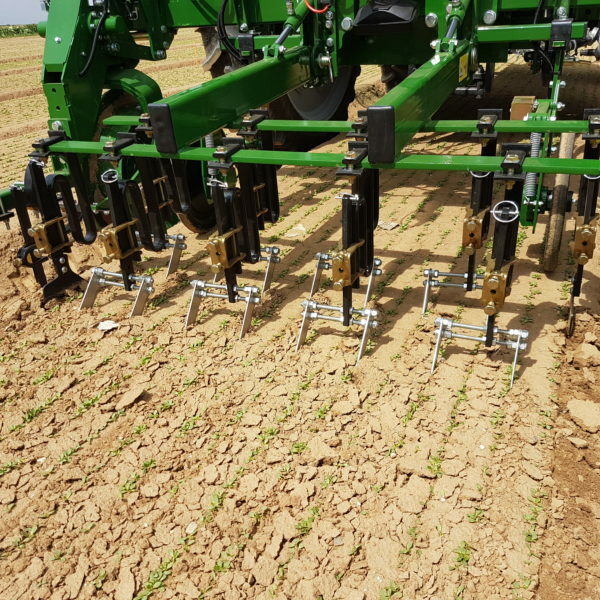 The machine is designed to deliver a high degree of accuracy for inter row hoeing in closely spaced crops, seeded using width roller-type seeders, producing a perfectly flatbed surface. Maximum weed control of 5mm accuracy is achieved using unique shares for minimal soil disturbance. Special baby weeder rakes ensure maximum exposing of weed roots to air while leaving a perfectly finished surface. Using a low camera position, accuracy is maximised for precise weed control between the crop rows. Soil engaging disc steer leads to accurate hoeing, whilst auto-levelling provides a stable platform, resulting in a perfect share depth. Using a mechanical weeding method instead of herbicide application also means aeration, drainage and breaks the soil cap for further crop establishment. The hoe is aimed at those growing delicate crops such as baby salad or herbs. While tractor mounted at the moment, there’s no reason why in the future this technology cannot form part of an autonomous field-based vehicle tasked with looking after a whole field of high value crops. Possibly looking towards a 90% reduction in plant protection product use. The future’s coming and it looks exciting. Harry will be speaking at the SmartHort 2019 conference about robotic and precision weeding. To register for the live stream, head to the SmartHort 2019 event page.